We teach our kids to throw garbage in the garbage bin, not on the street. An interesting way to market a kindergarten. It’s not about learning to communicate, play, and interact with others appropriately; it’s about teaching your children to become good citizens by disposing of their waste properly. 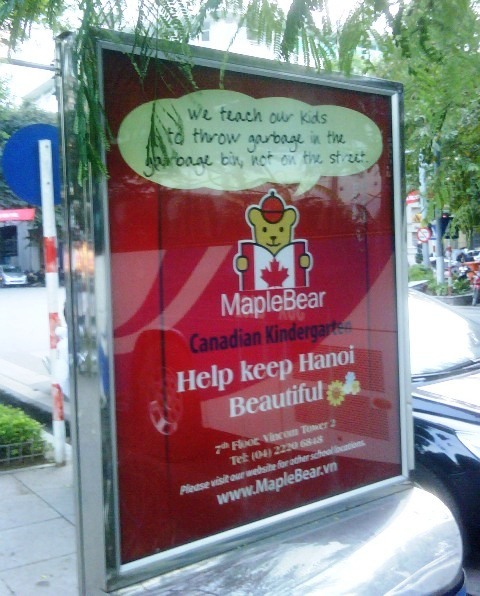 Is MapleBear Canadian Kindergarten onto something? Are parents drawn in by this subtle indictment of their parenting skills or a lack thereof? Schools as agents of socialization? If children learn to throw garbage in the garbage bin at school yet see their parents and other family members throwing it out the car window, are they really going to change? There are one of these schools in Bangalore India. Mark, the questions you ask at the end I have for India as well. It plays around and around in my mind. Also, with the emphasis on ‘soft skills’ and ‘personality development’ classes a big trend, the questions loom heavier over my head.